Possibly the immediate predecessor of Ka. c. 3150 BC? Map of Ancient Egypt with its historical nomes. 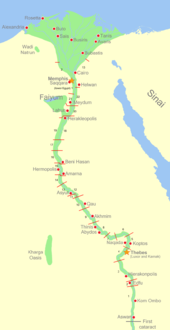 "Upper Egypt" is in the lower portion of the map. ^ The title was first used by Prince Farouk, the son and heir of King Fouad I. Prince Farouk was officially named Prince of the Sa'id on 12 December 1933. ^ See list of nomes. Maten (Knife land) is the furthest north nome of Upper Egypt on the right bank, while Atef-Pehu (Northern Sycamore land) is the northernmost on the left bank. Brugsch, Heinrich Karl (2015). A History of Egypt under the Pharaohs. 1. Cambridge, England: Cambridge University Press. p. 487. , originally published in 1876 in German. ^ Ermann & Grapow 1982, Wb 5, 227.4-14. ^ Rice 1999, p. 86. ^ Wilkinson 1999, p. 57f. ^ Shaw 2000, p. 196.